Structural History and Description of the Great Church. HAVING now collected all the documentary information that belongs to the construction and alteration of the great church, I will proceed to apply it in illustration of the plan and arrangement of the building itself, of which unfortunately so few fragments remain. When the chronicler Domerham speaks of the fire, he declares that it consumed the whole monastery and the church, reducing them to a heap of ashes. This expression is to be understood as applying to the burning of the roofs and wood-work of the buildings, and the general desolation which an extensive conflagration produces, the stone-walls escaping either unhurt or suffering only to a certain extent from calcination. For in other cases where a church and all its monastic offices are said to have been utterly consumed, as at Worcester1 in 1202, abundant remains exist of Norman work to shew that the fire did not essentially damage the walls. 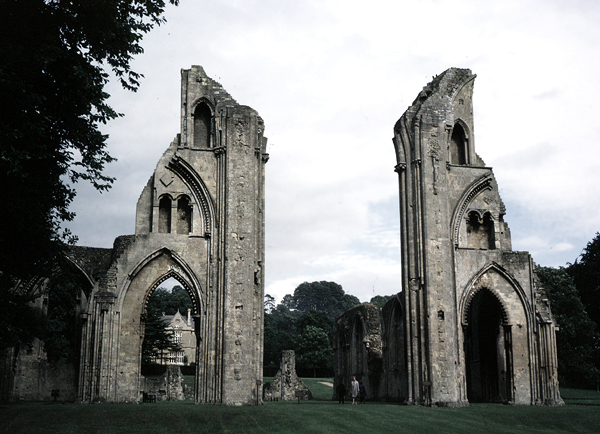 And in this example at Glastonbury it is simply said that when the king's camerarius came down after the fire he " repaired all the offices." We hear no more of them till the fourteenth century, when the cloister and its chapter house, dormitory, refectory, &c. were rebuilt. But the "church," under which term the vetusta ecclesia, and major ecclesia are included, was dealt with in a manner due to royal devotion and magnificence. We have seen that the vetusta ecclesia was built from the foundations on its old site, complete, and in the richest and most substantial style of that time. But the great church was laid out, apparently, without the least respect to the plan of the old one, excepting, perhaps, its western boundary, and on the highest scale of magnitude. We have not a fragment remaining to shew the extent of the first Norman church, and may therefore dismiss it altogether, conjecturing only that part of its nave was possibly roofed in and fitted up for the use of the monks during the construction of the new church2, which, of course, was commenced at the east end and carried on westward, and, as we have seen, was not dedicated till after 1303, 119 years after its commencement. As the plan shews, it was a cruciform. church, square ended, the nave contained ten severies (bays-JV), the eastern arm of the cross four severies, at first, augmented to six in the latter half of the fourteenth century. The transepts had three severies each, two of which had chapels projecting eastward, and the third opened to the aisle of the choir as usual. But these chapels have the peculiarity, that they consist of two compartments each, or in other words, as the plan will shew, that the transept has an eastern. aisle and chapels of one compartment beyond that. It may be remarked that the mother church of Wells, set out after the above was commenced, has the same number of severies in the nave and transepts. But the eastern arm had but three, augmented to six, in the first half of the fourteenth century, which, perhaps, induced the Glastonians to enlarge their own choir about the same time. 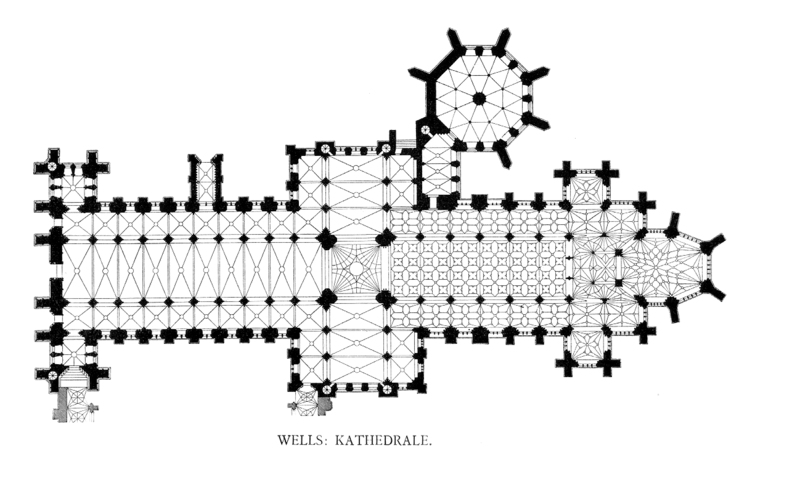 Wells, however, has western aisles to the transepts, but no chapels projecting from their eastern aisles. There is no evidence to shew whether or no this church had western towers. It is not probable that these members were omitted. 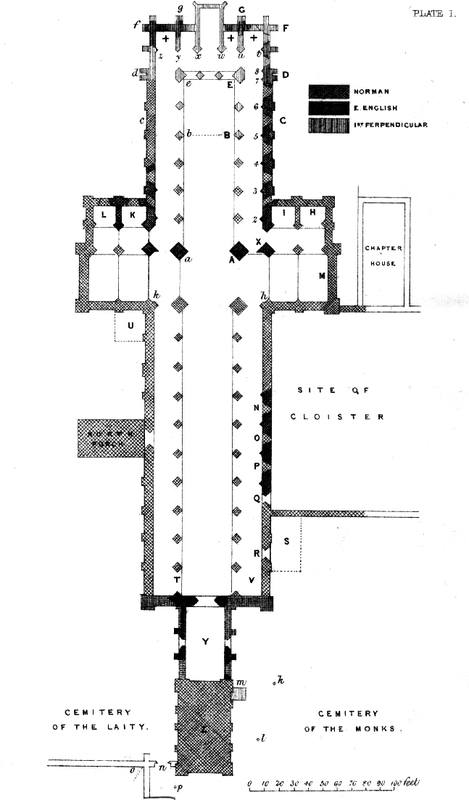 Worcester mentions an entrance porch of large dimensions 3, which I imagine was placed in a similar position to that of Wells, on the north side of the nave, and therefore opposite to the principal gate of the abbey, which Hollar places on the north of the cemetery of the laity, and at the end of a short lane opening from the great street at a point facing the parish church of St. John. A small chapel through which was the passage to the "gazophylacium" or almery, is mentioned as the place where the remains of King Arthur were deposited at first. Only two severies remain to shew us a specimen of the design of the central parts of this great church. These are on the east side of the transepts, both in similar but opposite positions, and each including one of the tower piers. Not one of the ordinary piers remains either in nave or choir. But the general plan of the latter piers can be obtained by inference from the great tower pier and from the north-west respond of the nave. The transept severy has in its lower story the pier arch which gives entrance to the end of the side aisle. Above is a triforium and a clerestory; the clerestory has one large window, and in front of it the usual triple arcade, consisting of a high, wide, stilted pointed arch, with a low narrow pointed one on each side. The gallery passage passes between the window and arcade as usual. But the shafts which commonly support this arcade are not employed. The arch moldings here are continuous.